Obama File 84 Why Was Obama's "Brain" Valerie Jarrett So Happy to Hire Communist Van Jones? Was it Fate? Why was President Barack Obama's friend and senior adviser Valerie Jarrett so happy to recruit Bay Area communist Van Jones to the White House? Van Jones' radicalism was well known on the US left. His links to STORM and Committees of Correspondence for Democracy and Socialism were no secret. Why would Valerie Jarrett be happy about a socialist advising her friend and president? Manning Marable, a leader of the Committees of Correspondence for Democracy and Socialism claims that Obama "understands what socialism is. A lot of the people working with him are, indeed, socialists with backgrounds in the Communist Party or as independent Marxists. There are a lot of people like that in Chicago who have worked with him for years..."
It seems that Valerie Jarrett is simply following a family tradition-one of promoting up and coming radical politicians. In the late 1940s Valerie Jarrett's future father in law, Vernon Jarrett was a rising activist and journalist on the South Side of Chicago. Jarrett and Davis also had a third organisation in common-Communist Party dominated Citizen's Committee to Aid Packing House Workers-which in 1948 was "organized to support the united packing-House workers of America C.I.O. now on strike"
To confirm the connection, below is a close-up of the organization's publicity committee. Note that it is chaired by Vernon Jarrett and includes Frank Marshall Davis. Louise T Patterson was the wife of Illinois Communist Party vice-chairman William Patterson and a prominent Party member in her own right. Late the same year Frank Marshall Davis moved to Hawaii where he was active in the underground Communist Party. At one point, like many of his comrades Davis became a Democratic Party official. Later in 1970, Frank Marshall Davis met and mentored a fellow future Democrat-Barack Obama. Vernon Jarrett was clearly on the left and possibly, like his colleague Frank Marshall Davis, a covert member of the Communist Party. According to a Washington Post obituary May 25th 2004. Washington was actively involved in Communist Party fronts, including the US Peace Council and the Chicago Committee on Southern Africa, right up to winning the mayoralty-with Party support. After victory he stacked his administration full of communists, socialists and sympathisers to create one of the most far left administrations in US history-cut short only by his pre-mature death in 1987. According to quote from remarks by Illinois Communist Party organiser John Bachtell to a "Special District Meeting on African American Equality and Building the Communist Party and Young Communist League, Chicago", IL September 30, 2007. Barack Obama has stated that Harold Washington's victory in 1983 was the spur that made him leave New York for a $13,000 a year job "community organizing" in South Chicago. Paul Robeson incidentally, encouraged Frank Marshall Davis to move to Hawaii. The Jarrett/Obama conection did not end with Vernon Jarrett's death-it moved to a higher level. 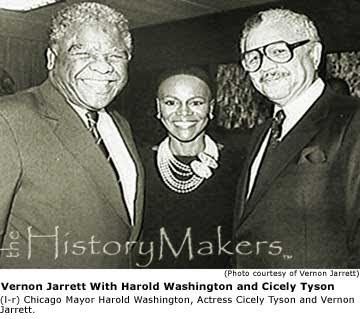 A former Deputy Corporation Counsel for Finance and Development under Harold Washington, Valerie Jarrett continued to work in the mayor's office into the 1990s. In 1991, while Deputy Chief of Staff for Mayor Richard Daley, Valerie Jarrett hired Michelle Robinson, then engaged to Barack Obama. Jarrett became one of the Obamas' closest friends and advisers-sometimes even described as the "other side of Barack's brain"..
Valerie Bowman's marriage to Vernon Jarrett's late son only lasted five years but the Bowman and Jarrett families had been life long friends. 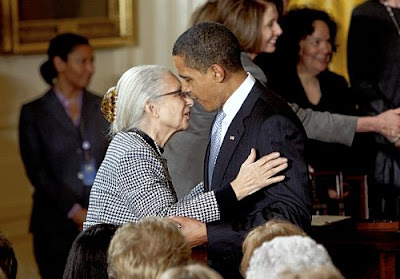 Valerie Jarrett's mother, early childhood education authory Barbara Taylor Bowman also has some interesting connections. For several years she has run the Chicago based Erikson Institute. An ealy Erikson board member was Chicago businessman and "liberal" activist Tom Ayers-father of Weather Underground terrorist leader and long time Obama colleague Bill Ayers. Bernardine Dohrn, wife of Bill and reputedly the real leader of Weather Underground has also served on the Erikson board in recent years. "Just south I see the Robert Taylor Homes named for the first head of the Chicago Housing Authority, whose daughter, a neighbor and friend is president of the Erikson Institute." Bill Ayers and Bernardine Dohrn have both been leaders of the radical Movement for a Democratic Society-alongside Van Jones associates Roxanne Dunbar-Ortiz and Betita Martinez. Barbara Bowman was interviewed for Timuel Black's "Bridges of Memory: Chicago's First Wave of Black Migration-an Oral History". Timuel Black, serves on the advisory board of Committees for Correspondence for Democracy and Socialism alongside Manning Marable and Van Jones' mentor and friend Betita Martinez. Timuel Black is also a long time friend of Barack Obama. 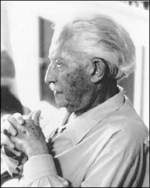 The Erikson Institute is named after pioneering child educationalist Erik Erikson, an errant disciple of Sigmund Freud and coiner of the phrase "identity crisis". In 1950 Erikson became a cause celebre on the left after leaving the University of California rather than sign an anti-communist loyalty oath. Interestingly Larry Friedman, activist and author of the 1999 book "Identity’s Architect: A Biography of Erik H. Erikson" also had ties to communism and California. Larry friedman states that he been in contact with Erikson since the 1960s. Did the introduction come through his Communist parents? Coincidentally Dorothy Healey, once the top communist in Southern California, later attended the 1992 founding conference of the Committees of Correspondence in Berkeley-alongside later Van Jones associates Betita Martinez, Roxanne Dunbar-Ortiz, Max Elbaum, Arnoldo Garcia and Bob Wing. In March this year the Communist Party's People's Weekly World reprinted an IPS article on the prospects for children under Obama. "It is important to remember that for the first time in a long time we have a person who gets it," said Barbara Bowman, a consultant to the U.S. Secretary of Education, praising Obama for "(understanding) the importance of early childhood care and education." It's almost as if it was fated that Jones', Jarrett's and Obama's paths would cross. On this page Trev, there is a post saying Amrican Public Radio has credited you with breaking a Van Jones story. How about Obama's "Car Czar", Ron Bloom's socialist leanings? You may want to look at some "green"-friendly cars that are out on the streets here in the USA. They literally look like four-wheel golf-cart, go-carts! I'm sure it's quite unsafe if those sort of cars get in a horrible accident. You may have not intended to do so, but I think you have managed to express the state of mind that a lot of people are in. The sense of wanting to help, but not knowing how or where, is something a lot of us are going through. Please come visit my site Nunavut Canada when you got time. Get this page to Glenn Beck. He just did a big expose' on her and he's going after her hard. He asked for people to tweet him with info on Jarrett. Everyone send Trevor's article to him. Does anyone think Beck knows about Golitsyn, and if you think he does, do you think he'd ever have the guts to lay it all out? The CIO was not Communist-controlled in 1948. On the contrary, it was anti-Communist- controlled. In fact, the following year, all affiliate unions whose leaders who refused to sign affidavits foreswearing Communist sympathy were kicked out of the CIO altogether. (See e.g. Robert Zieger's book The CIO.) Oops, sorry to ruin your theory. "The Blogger Who Nailed Van Jones"